3rd visit to Bakerzin within a month! The Gods Must Be Crazy! 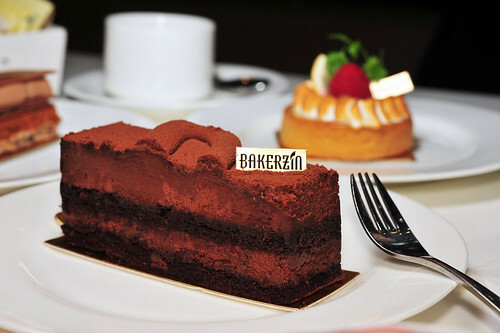 And that’s if you don’t count the “Macarons Takeaway” visit at Bakerzin Vivocity two days back! Truth is, we went back to do some online reading, basically to get to know what are the raves of this place and these fellas popped up! So here we are to check ’em out! We ordered two tea sets, which we thought was a steal as they came with a choice of tea and a cake each at only $8.90 per set! I chose Vanilla Bourbon while J’s was Chamomile. On top of that, we ordered a tart as well! Dessert overload! 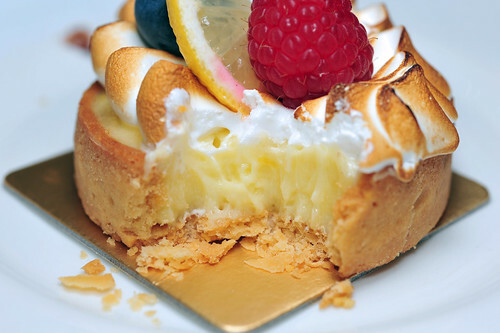 Lemon Tart – Sable cookie shell with smooth lemon curd and cream, crowned with blazed italian meringue and assortment of summer fruits and herb sprig for decor. We chose this as a comparison to Tarte Citron from Canelé Pâtisserie Chocolaterie we had a couple of days back. The tasting order is still the same, i.e. fruit based desserts first. No offence but we liked Canelé‘s version slightly better. The lemon curd used here was a tad too overwhelming for us. We liked the tangy sharpness but decided that it would have suited us better if the taste was more subtle. What an irony isn’t it!? But this is entirely a case of personal preference. 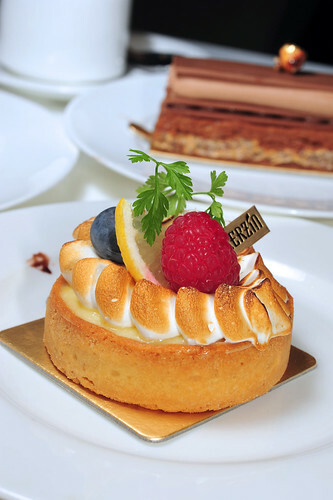 In retrospect, perhaps we might even feel that Tarte Citron tastes watered down IF we had sampled Bakerzin’s Lemon Tart first. For this, we would have to try them out again in due time. That means more tarts for a tart like me! Yay! 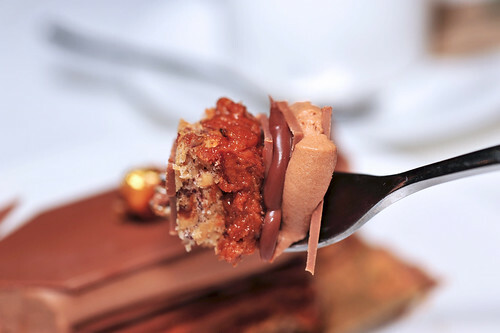 Sweet Pleasure – Layers of Hazelnut Praline dacquoise, Jivara milk chocolate, chocolate ganache with fleur de sel, topped with chocolate mousse. We affectionately called this the “Ferrero Rocher Cake” due to the similarities in ingredients (hazelnut and milk chocolate) as well as textures it harnesses with the famous chocolate candy. Of course, dessert lovers with more refined tastebuds may disagree with this co-relation and consider it a blasphemy! 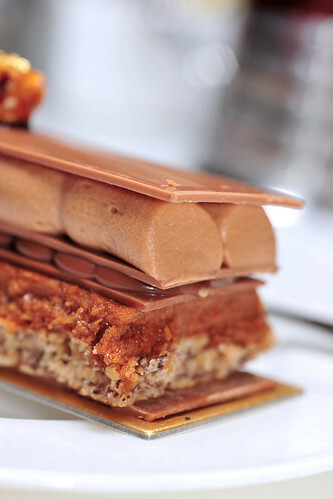 Sweet Pleasure is undoubtedly inspired by Pierre Herme’s Plaisir Sucré. 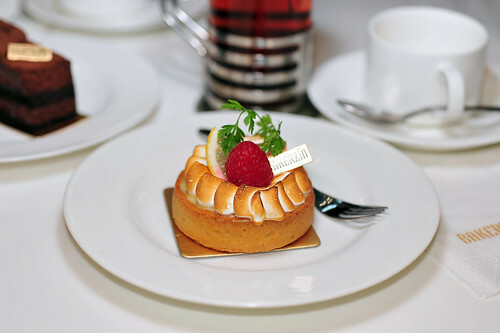 After all, its name is a direct translation of the French patisserier’s masterpiece. Herme’s Plaisir Sucré itself is quite a story. 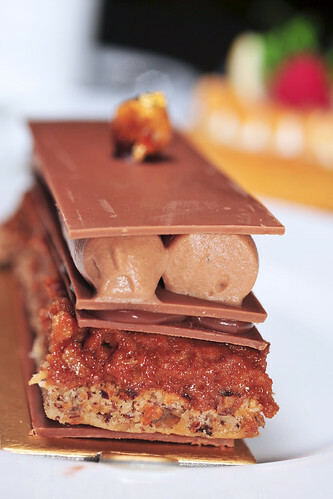 It is an improvisation of the infamous cherry cake which Herme created in the early 1990s, which resulted in an uproar amongst the Parisian culinary circle when it was first introduced to the world, largely due to the liberal use of milk chocolate, an ingredient generally frowned upon by French patissierie purists! 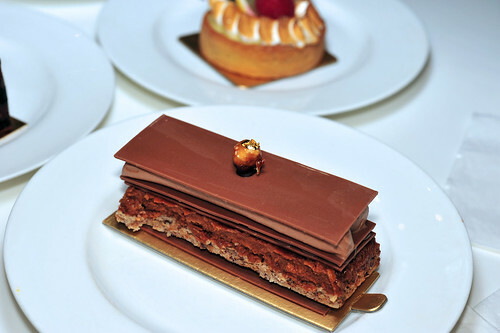 It is essentially a hazelnut praline dacquoise with 4 pieces of rectangular chocolate cutouts (Valrhona Jivara Milk Chocolate with 40% cocoa) layered with chocolate ganache (I read Bakerzin uses Valrhona Caraïbe), Jivara Mousse made of Jivara milk chocolate and whipping cream. Recipe of Plaisir Sucré can be found in Pierre Herme’s “Chocolate Desserts” edited by Dorie Greenspan, but I presume Bakerzin would have modified the recipe to suit the local crowd. Multitude of flavours exploding with every mouthful! Absolutely adore the interplay of textures! Chocolate Amer, flourless chocolate sponge layered with bitter chocolate mousse dusted copiously with cocoa/chocolate powder. This rich chocolate cake ranks high amongst online foodies and we just have to try it out! The cake is surprisingly delicate, something which we had not expected. I wonder if its due to it being “flourless”. The mousse layers were rich and delicious but somehow this cake failed to make us “oooh” and we attributed it to two possible reasons. (1) We were already sent up skyhigh by “Sweet Pleasure” (Trust me, the experience is simply ethereal!) prior to tasting Chocolate Amer and can’t help but drooped a bit when It failed to elevate us further. (2) Hype naturally creates expectations, and with all the raves we read online for this cake, expectations most certainly ran high. In fact, we came specifically to sample this cake as it ran out at the Suntec outlet when we last dined there. So heed us not! Go there, try it and let us know if you liked it! This entry was posted on December 28, 2010 by Alan (travellingfoodies). It was filed under Food and was tagged with Paragon Shopping Centre, Singapore.